Tonight will almost certainly be the last time I have to drink a glass of milk, eat a cookie (being careful to carelessly scatter a few crumbs around) and take a reindeer-size bite out of a carrot before going to bed on Christmas Eve. Not to mention faking the traditional ‘thank you’ letter from Santa and Rudolph, and leaving some telltale boot prints around the fireplace. The last of our kids is now 10 and while he desperately still wants to believe, rational thought and peer pressure are taking their toll. It’s that awkward stage where kids want to know so they aren’t made fun of by the Santa-savvy spoilsports at school, but at the same time don’t want to know, fearful perhaps that all the magic of Christmas will suddenly disappear along with the gifts from Santa. And they must be from him because they are always mysteriously wrapped in different paper from the presents from Mummy and Daddy and the gift tags are in different writing (almost as if Dad wrote them left-handed, in fact …). Every year the questions about how Santa manages to deliver all the world’s presents in one night get trickier to answer. Once the sheer wonder of flying reindeer has passed, it’s not long before you’re being peppered with time and motion studies, logistical questions and the dubious practice of space travel in a red furry suit with no oxygen helmet. By age 7, they realise the whole concept of flying reindeer is definitely a little suspect. The pressure of keeping up this charade year after year is now so great, it was almost a relief when my son folded his arms and looked me firmly in the eye and said: “Dad, honestly. Is Santa real or not? Yes or no.” I, of course, looked firmly back, father-to-son and … didn’t have the heart to give a straight answer. I waffled something about it being like God; that just because you can’t see him doesn’t mean you can’t believe. We both know the game’s up, really. My son isn’t stupid and so for now he’s willing to play along with the whole ‘Santa won’t bring you the new JumboFXPlayStationNerfo system if you don’t eat your veggies/do your music practice/homework’ nonsense if it prolongs the magic of Christmas stories and movies a bit longer. Maybe we both just want to hang on to that last shred of childhood innocence as long as possible. After all, it may be a while before grandchildren come around. But for now the magic still remains. ‘Tis the night before Christmas and all through our house waft the wonderful smells of Christmas baking and the tree is sparkling with lights. The stockings are hung and you can feel a child’s anticipation and excitement. Why wouldn’t you want to still believe? Good night to all and to all a good night! Merry Christmas everyone! 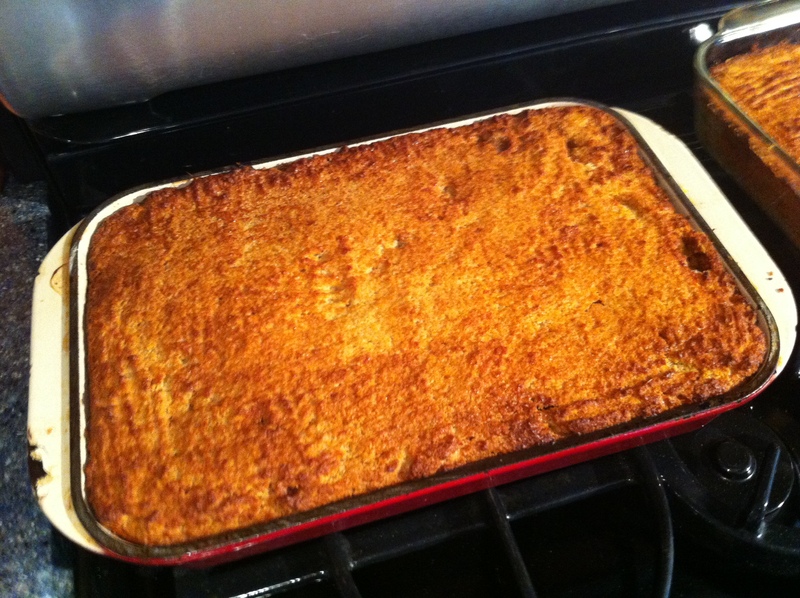 Making cassava pie is a Bermudian Christmas tradition. For the uninitiated, it’s a cholesterol-laden savoury-sweet dish made from grated cassava root with a cake-like texture and chicken or pork in the middle, and served as a sidedish with Christmas dinner. Bermudians take their cassava pies as seriously as kite flying, fishcakes and black rum, and every family and restaurant has its own recipe. There’s even a Bermuda Cassava Pie Club on Facebook. I’ve been refining my version down the years from a variety of sources and after I posted a photo of this year’s effort on Facebook, several people asked for my recipe, so here it is. I like my cassava moist and less “cakey” with chicken, not pork, so feel free to tweak to your taste! This recipe will easily feed 12 people. Boil chicken pieces until just cooked in lightly salted water with thyme. Strain liquid and retain for stock. Cut chicken into small chunks. Drain cassava, squeeze out extra liquid by wrapping in cheesecloth or tea towel. Cassava should crumble in your fingers but still be moist. Place cassava in large bowl and add sugar/butter mixture, eggs, milk, salt and spices. Mix thoroughly with wooden spoon to make dough. Place about a third of dough on bottom of well-greased deep 9×13 foil pan (use Crisco or Pam Baking spray). Spread chicken pieces evenly over dough (leave about a thumb-sized gap around edges). Pour one cup of stock over chicken. Cover with remaining dough.